A new novel weaves London folklore and Metropolitan Police procedure in a bewildering tale of magical mayhem. What if magic really existed? What if it was controlled by a secret coterie and used to protect the public from bad-natured spirits and bogeymen? So far, so familiar - think Harry Potter meets Strange & Norrell. But Ben Aaronovitch offers up something new by putting the Metropolitan Police Force at the heart of his magical world. Following a ghostly encounter in Covent Garden, junior plod Peter Grant discovers that the Met have a secret unit dedicated to magic and the supernatural. Grant becomes a novitiate, under the tutelage of enigmatic Detective Inspector Thomas Nightingale, and soon picks up an incantation or two. The rest of the book bounces around two cases - keeping the peace between various river deities (including Old Father Thames), and tracking down a malign spirit whose hobbies include magically cracking open people's faces until they look like Mr Punch. Derivative though much of this may sound (especially to Christopher Fowler devotees), some excellent world-creating is at play here. The 'rivers' of the title refers to a set of saucy water nymphs whose names follow those of London's watercourses - Fleet, Ty, Beverley Brook, et al. The mechanics of magic are intriguing - we only get a taster in this book (sequels on the way), but a regular reference to the laws of thermodynamics underpins the unbelievable with a plausible if pseudo-scientific framework. Believability is also its flaw. The main character seems unfazed to learn the truth about ghosts and vampires and water spirits. Maybe it's his police training, but we suspect even a constable of the force would go through some kind of personal struggle after witnessing the mutilation of innocent faces, or upon discovering he could conjure up balls of fire. Emotion is almost entirely absent. If you're looking for a deep novel, this is more trickling Walbrook than mighty Thames. That said, we can't fault the pace, ingenuity and creativity of Rivers of London. With each page, we're eager to learn more about this mysterious new world, set on very familiar streets. Fans of location will be particularly happy. Aaronovitch uses real London pubs, restaurants and cul-de-sacs to play out his story. So much so that we swear the final scenes are set in our mate's back garden, in an obscure corner of Runnymede. Maybe there is some real magic in here after all. 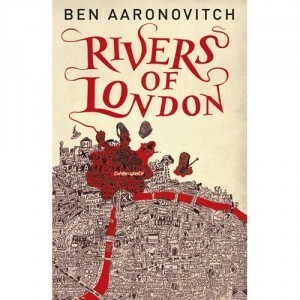 Rivers of London by Ben Aaronovitch is out now from Orion Books, with sequels planned for later in the year. By now on Amazon.